This weekend I have a stamp-a-stack (aka SAS) for my cousin. It will be a great day, particularly as her daughter and my daughter are only 2 weeks apart in age and will have a ball playing while we have fun making cards! What is a stamp-a-stack? It’s where you make a stack of 10 cards, usually of 2 different designs. This is one of the cards I have chosen for the day. We will be making 5 of these cards which my cousin’s guests will be able to tailor using the greeting stamps from Warmest Regards (retiring at the end of this month). The card, except for a few minor details, is a complete case from Splitcoaststampers. You can check out the original card here. Thanks so much Michele Boyer (Paper Cuts) for a great card! The original card had the advantage of using the Stampin’ Up! In Colour, Purely Pomegranate, which will be available in Australia from 1 April 2008! I can’t wait … that’s next Tuesday!! This is the other card we will make. I apologise for the poor quality … of card (!) … my original card took a little battering at the last card class I ran and is a little worse for wear with extra ink spots on it. Such is life! I’ll post a nicer card up next week 🙂 This is an excellent card for a stamp-a-stack! With the Birthday Best (in the old and new catalogue for only $25.95! ), guests can change from flowers to balloons to cupcakes and have a variety of cards to take home, should they choose to dip into their “creative well”. It’s one of the best value stamp sets in the catalogue and one of my favourites! For the greeting on this card I’ve used the stamp set, God’s Blessings, but if you don’t have that stamp set then the Birthday Best greeting is just fine too 🙂 I’ve also used Simply Said flowers at the top of the card, but they aren’t coming up well in the photo. My apologies. If you like the idea of organising a few friends around for a SAS, then drop me a line and we can book a date today (in Sydney, NSW, please). The cost for a SAS is $20.00 plus $3.00 for envelopes (envelopes are optional). Well, two catalogues come to an end on 31 March 2008. The 2007-2008 Idea Book & Catalogue comes to an end. And the Summer Mini Catalogue also comes to an end. I made this card using the Long-time Friend stamp set and the Flirty ribbon from the Summer Mini Catalogue (I just love Flirty ribbon and highly recommend it). To show you how different the same image from that stamp set can look, for the card below, I stamped the background with the Floral background stamp (fortunately, Floral has not retired). This is your last chance to order from both of these beautiful catalogues. From 1 April 2008 the 2008-2009 Idea Book & Catalogue will be current. If you would like to place an order, please check to make sure what you want to order is still in stock here, and email me at rachel.capps@yahoo.com.au before 31 March 2008. Josh on the other hand, only 2 years old last week, wasn’t interested in the least. He was too busy driving his matchbox cars around on his new garage. Except when Bella started to actually stamp, THEN he became interested in the ink pads … so he ended up with some ink on his fingers, which we effectively removed from his fingers on the paper… then he decided to kiss the ink pad too! So, again, pressing the paper on his face did a great job removing most of the ink off his face! I added the ‘Celebrate’ stamp. Can you see the lip and chin marks on the card?? Both kids were very impressed with their cards. When Daddy came through the door, he was greeted with two children waving their cards in the air clamoring to give him their cards and wishing him a ‘Happy Birthday!’. Priceless. It’s Easter next weekend already! Easter is only next weekend (although you’ve been able to buy hot cross buns in Coles since 1 January this year!). These are a couple of the cards I have made to send to family and friends this year … it’s the first year I think I’ll be giving Easter cards to my family and friends, but when I can make them instead of buying them … it is all so much more affordable 🙂 And the effort spent making cards instead of searching for cards through crowds of shoppers is so much more enjoyable and satisfying! This card was made using Whisper White card stock and some Certainly Celery and Pretty in pink card stock. I love the simplicity and crispness of Whisper White cards. And I love my new markers … they are so much fun to play with (that’s how I did the pretty flowers)! I used Bunny Hugs and Simple Somethings stamp sets. 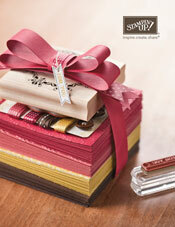 Very similar in design to the above card, except using Chocolate Chip, Pretty in Pink and Mellow Moss card stock. I had to have fun with some paper piercing too, can’t help myself! Which card do you prefer … see if you can post a comment (as I know sometimes it doesn’t work). If you like the Bunny Hugs stamp set, which could be used for babies as well, then remember that it is in the Summer Mini Catalogue for only $33.95 and that ends at the end of March. So place your order with me before then or miss out on Bunny Hugs forever!